Deputy head of Hamas's political bureau Mousa Abu Marzouk said his Movement can never change its national policies or engage in negotiations with the Israeli occupation state. "Hamas will not change its policy with regard to its refusal to recognize Israel and will not sit with it negotiating and compromising the rights of the Palestinian people," Abu Marzouk said in a press statement to the Palestinian information center (PIC). "What do the Zionists aim when they claim there are indirect negotiations with Hamas?! And what do others want when demanding Hamas to reveal what they call 'the truth' to the Palestinian people?! The Hamas official rhetorically questioned. "Do the Zionists want to open dialog with Hamas and the others fear that? We, however, say that neither the former's wishes and pressures, nor the latter's keenness on sharing the cake of negotiations with no one and its declared fears in this regard can make us change our policy against recognizing Israel or negotiating with it," Abu Marzouk added. He stressed that the Palestinian people are aware that Hamas always transparently addresses important issues that concern their lives through the Egyptian side as it had done during the prisoner swap deal and the previous wars. "Hamas has not known what was tabled in the recent meetings that took place between the Egyptian side and the Zionist side, and it was not a third party to these talks," the official affirmed. "But we expect that our brothers in the Egyptian intelligence will tell us about that and convey our viewpoints on topics of interest, including the issues of the fishing zone in Gaza sea, the crossings and the free movement of individuals and goods, the crossings between the West Bank and Gaza, the hunger strikers, the families of exiles, the Zionists' obligations under the prisoner swap deal, the return of 18 ex-detainees to the West Bank and finally the Zionist attacks on the citizens living west of the armistice line or the separation fence along the borderline," he stated. Hamas spokesman Fawzi Barhoum said that Israeli Prime Minister Benjamin Netanyahu's announcement that Tzipi Livni would handle efforts to renew peace talks with Palestinians determines features of the next stage and put an end to negotiation process. Barhoum said in a press statement published on his Facebook page on Wednesday: "This is a confirmation of the failure of the option of negotiations and determines its inevitable fate." He stressed that this new decision needs initiating a Palestinian national dialogue to restore the national project and the resistance program, to protect the constants and de-legitimize the occupation. The dean of liberated prisoners Nael Al-Barghouthi has opined that a third Palestinian intifada was in the horizon due to the Israeli practices against prisoners, political stalemate, and escalating settlement activity. Barghouthi told the PIC on Tuesday that the Israeli occupation authorities had escalated aggression on all Palestinians and their property and land. He said that the stalemate in the political process coupled with the growing anger in the hearts of Palestinians because of the escalation in settlement drive, daily attacks, confiscation of land, and military barriers would eventually lead to an explosion and an intifada to restore dignity and freedoms usurped by occupation. The ex-captive blamed the world community for all what is befalling the Palestinians for dictating conditions on the Palestinian victims and speaking softly to the Israeli aggressors. Deputy head of Hamas's political bureau Moussa Abu Marzouk denied news reports claiming that there were indirect negotiations between his Movement and Israel, describing such news as Israeli fabrications. "We just know that an Israeli security delegation visited Cairo more than once to discuss the measures to stabilize the ceasefire in light of the continued field breach of the truce by the Israeli side," Abu Marzouk stated in an interview conducted by the London-based Al-Hayat newspaper and published in its Tuesday issue. "We have not sat with the Egyptian side to see what came out of the talks they conducted with the Israelis," the Hamas official affirmed. As for the planned meeting between Hamas and Fatah during this month, the official said that the reconciliation talks would take place away from the contentious issues and the media wrangling. He affirmed that the national government to be formed would be headed by president Mahmoud Abbas and would include 19 ministers from the independents and the technocrats, adding that the cabinet would have specific tasks as agreed between the political parties. He said that his Movement responded to Abbas's call for making the government of three months' duration and is determined to move forward and overcome all obstacles until the achievement of the Palestinian reconciliation. Salim Al-Zanun, the chairman of the Palestinian national council, condemned on Sunday the Bulgarian deportation of a Palestinian legislative council delegation from Sofia. Zanun, in a statement published by both the PLC and PNC in Ramallah and Amman, said that expelling the three PLC and PNC members ran contrary to diplomatic norms. Describing the Bulgarian act as “unethical”, Zanun said that the three Palestinian MPs entered Bulgaria in response to an invitation and after attaining entry visas. The PNC chairman asked the Bulgarian parliament to condemn the act, which would negatively affect the progress of Palestinian-Bulgarian parliamentary relations. Dr. Mousa Abu Marzouk, deputy political bureau chairman of Hamas, has urged the Bulgarian authorities to apologize for the non-protocolic expulsion of a Palestinian parliamentary delegation. Abu Marzouk told the PIC that the deportation of the parliamentary delegation in the manner it occurred was an insult to the Palestinian people that necessitated an apology on the part of the Bulgarian authorities. He said that the parliamentary delegation, comprising members of the Hamas-affiliated change and reform parliamentary bloc, had entered the country in an unequivocal official manner. The Hamas leader described the deportation procedure in the way it took place as “uncivilized”, adding that if the delegation members were persona non grata then there should have been a more civilized method to end that visit. He charged that the Bulgarian act reflected bias to Israel and compliance with its pressures. Abu Marzouk said that the Bulgarian authorities should apologize to the Palestinian people and their MPs for such a “shameful” act, adding that the Palestinian leadership and MPs should not remain silent vis-à-vis what happened. He asserted that the Palestinian presidency should be the first to condemn such an act. Abu Marzouk, shifting to another issue, said that a meeting between Hamas and Fatah is slated for 27 February in Cairo to discuss formation of the unity government. MP Nasser Abduljawad has warned that conditions in the West Bank were not yet ripe for holding general elections, which, if held, would deepen division rather than heal it. Abduljawad said in a press release on his Facebook page that holding elections was a necessary procedure but only in appropriate circumstances that would reflect the Palestinian people’s will and conscience. There could be no honest elections in the West Bank in light of the prevailing conditions of security harassment, he said, warning of “clear signals” that the elections would be rigged. The MP pointed out that many activists were detained and questioned about their role in the former election in a bid to terrorize them and obstruct their involvement in any future one. Abduljawad also pointed to the continued persecution of MPs and political activists of the Islamic movement and all those having contact with them. The MP also mentioned disturbing citizens in their livelihood and preventing their employment in government posts because of their positions in the previous elections as other forms of conditions that would infringe on integrity of any elections. Fawzi Barhoum, a Hamas spokesman, has denied that his movement was engaged in direct or indirect talks with Israel over ending its six-year blockade of the Gaza Strip. Barhoum said, in a press release published on his Facebook page on Saturday, that what the Israeli media had published in this regard was nothing more than follow up on the calm agreement that was brokered with Egyptian mediation. He said that the (Hamas-controlled) government in Gaza was maintaining talks with Egyptian officials to discuss implementation of articles in the calm agreement including opening crossings and entry of goods and construction materials. Palestinian resistance factions concluded a calm agreement with Israel through Egyptian mediation late last year following the Israeli aggression on the coastal enclave. Dr. Salah Bardawil, Hamas leader and member of its parliamentary bloc, confirmed that necessary measures will be taken to respond to Bulgaria's expulsion of Hamas's delegation visiting the country. Bardawil talked, at a press conference held on Saturday at the arrival of the delegation to Rafah crossing, about the visit's details, noting that the delegation had been invited by Bulgaria's Center for Global and Middle East Studies to deliver several lectures and conduct political meetings. Bulgarian authorities had deported the MPs Salah Bardawil, Mushir al-Masri, and Ismail al-Ashqar, in a move described as political foolishness that came as a result of Israeli pressure. Bardawil described the act as a serious affront to the Palestinian people, pointing out that the delegation had been deported to Istanbul airport and then to Cairo airport. He stated that Bulgarian government's actions were contrary to all diplomatic norms and represented a violation of the parliamentary immunity that is protected under international law. The Hamas leader demanded Bulgaria to offer a formal apology, and called on all the Arab and international bodies, particularly the parliamentary bodies, to condemn the act. Palestinian Affairs Center in London expressed in a press release its deep concern at reports that talked about the involvement of the Palestinian Authority in Ramallah in inciting the expulsion of Hamas' parliamentary delegation, noting that "Ramallah authority had already made it clear that it rejects any official visits to and from the Gaza Strip." The center denounced the Bulgarian authorities' action, stressing that the delegation of the Palestinian Legislative Council entered the Bulgarian territories officially. It called on the European Union, its member states and institutions "to respect the results of the Palestinian democracy and reject all pressures exercised by the occupation authorities or the PA in Ramallah. The Hamas Movement strongly denounced the Bulgarian security forces for raiding on Friday morning the residence of the Palestinian parliamentary delegation and deporting its members. It described such act as reprehensible and biased in favor of the Israeli occupation regime. "We express our strong condemnation and protest for this irresponsible behavior by the Bulgarian security, especially since the Palestinian parliamentary delegation received all official approvals before entering the country as well as an invitation from Bulgarian bodies and institutions," a Hamas official stated in a press release. "We call upon the Bulgarian authorities to rectify its position and apologize to the Palestinian people and their lawmakers for this behavior," the official underlined. He also demanded Bulgaria not to yield to Israel's pressures and to stop using a double standard policy with the Palestinian cause. In a related context, Palestinian premier Ismail Haneyya on Friday phoned the deported lawmakers after they arrived in Turkey coming from Bulgaria. Haneyya affirmed that his government sent a strongly-worded letter to the Bulgarian government, in which it considered this act by its security forces as a violation of the parliamentary immunity that is protected under international law. For its part, the Palestinian legislative council (PLC) expressed its dismay at the deportation of its members from Bulgaria after it was officially invited to visit Sofia city. Its spokesman MP Atef Adwan expressed his belief, in a press statement to Quds Press, that Zio-American pressures might have been placed on Bulgaria to expel the Palestinian lawmakers, so as to dissuade other European countries from following suit. Adwan stated that the parliamentary delegation officially entered Bulgaria and conducted important meetings with officials there, which proves that their unexpected deportation happened following Zio-American pressures. A Palestinian delegation from the change and reform parliamentary bloc of Hamas arrived last Wednesday in the Bulgarian capital Sofia to deliver several lectures and conduct political meetings. This deportation incident also raised the ire of many Palestinian activists who, in general, condemned what happened to the MPs as an insult to the Palestinian people. Human rights activist Mustafa Ibrahim described, on his facebook page, what happened to the Palestinian MPs as an incivility, an affront to the Palestinian people and political hypocrisy by Bulgaria and the international community. "This international community uses pressures against us, play the hypocrite, and take sides with Israel in its crimes and its denial of our rights in Palestine," Ibrahim stressed. For his part, political analyst Ibrahim Al-Madhoun opined that the deportation of the Palestinian lawmakers could be seen as a positive incident that gathered media momentum in favor of the Hamas Movement. "The world may not have known that a delegation from Hamas or lawmakers from Gaza had visited Bulgaria, but today the news about their unconventional deportation from this country hit the headlines all over the world," Madhoun said. Dr. Khalil al-Hayya, member of the Political Bureau of Hamas, confirmed that the file of liberties in the occupied West Bank has been obstructing the achievement of Palestinian reconciliation. Hayya told journalists on Saturday: "Hamas is not ready and does not agree to hold elections if the freedoms file is not completed in the occupied West Bank", noting that it includes the political arrests, summonses, and the confiscation of properties. He also pointed out that political arrests in Gaza have been completely halted and that 95 members of Fatah have been allowed to return to Gaza. He stressed that the agreements that took place between Fatah and Hamas covered all issues, including the security file, and pointed out that it was agreed on criminalizing security coordination, and on the role of resistance as a right for every Palestinian. The Palestinian leader pointed out that the reconciliation will be hampered because of US president Barack Obama and his secretary of state John Kerry's visit to the region. When Khaled Meshaal spoke to Mahmoud Abbas about this issue, he explicitly said that the Americans are putting pressure on the PA, he added. Concerning the violations of the truce signed after the latest Israeli aggression on Gaza, Hayya says that his movement demands Egyptian officials to oblige Israel to implement what was agreed upon. Meanwhile; the PA Preventive Security Service arrested in Salfit and al-Khalil two liberated prisoners and five members of Hamas. The General Intelligence has summoned in Ramallah a liberated captive and ex-political detainee and the brother of journalist Mohamed Awad after his return from Jordan to which he had travelled to receive medical treatment. The same apparatus summoned two liberated captives from Nablus, who both had been earlier arrested several times in the jails of PA's apparatuses, and a student at Al-Najah University in Tulkarem. The Intelligence summoned on Saturday, the son of the kidnapped MP in the occupation prisons, Bassem Zarir, for the second time within a week. Bulgarian security forces on Friday raided the temporary residences of a visiting Hamas delegation in Sofia, and then expelled the officials from the country, according to JPost reports through Ma'an. On Wednesday, 13 February, a delegation from Hamas arrived in Bulgaria to present the "Palestinian narrative and expose the false Israeli narrative on the Palestinians and Hamas." The visit was the first official visit by Hamas authorities to an EU member state. According to JPost, Palestinian news organization Ma'an quoted a statement released by Hamas' parliamentary list as saying that the Bulgarian raids were at least in part prompted by Israeli, US and British pressure. The Bulgarian government has rejected reports that these meetings took place between official representatives of the government and Hamas officials. Ismail al-Ashkar, head of the Hamas parliamentary list, led the delegation. Hamas legislators Salah Bardaweel and Mushir al-Masri, who is also a spokesman for the Islamist movement in the Gaza Strip, accompanied him. Bardaweel reported to Ynet that local police arrived at the delegation's hotel and took the members to the airport with the intent of deporting them to Turkey. Bulgarian Foreign Ministry spokeswoman Vessela Tcherneva told The Jerusalem Post on Thursday that "Bulgaria is part of the EU politics as listing Hamas as a terror organization." She added that the Hamas representatives are "on a private visitation of an NGO" in Sofia. Israel has expressed its dissatisfaction with Cyprus' decision last week to extend diplomatic recognition to the State of Palestine by upgrading its mission in Nicosia to that of an embassy. During a visit of Palestinian Foreign Minister Riyad al-Malki to Nicosia last Friday, his Cypriot counterpart Erato Kozakou Marcoullis announced the government's decision to upgrade Palestine's diplomatic mission to that of an embassy. The upgrade follows on the heels of the UN General Assembly's overwhelming vote on November 29, 2012, to upgrade Palestine's status at the United Nations from a non-member observer state to "observer state". Cyprus, along with 13 other EU member states, supported the Palestinian bid at the UNGA, while 12 abstained and the Czech Republic voted against. While falling short of full UN membership (blocked by the US which has veto power in the UN Security Council), Palestine's upgraded status offers, among others, access to the international criminal court which Israel fears will bring about charges over crimes of war or against humanity. Last week's decision made Cyprus the first EU country to upgrade a Palestinian diplomatic mission to that of an embassy following the UNGA's November vote. Marcoullis highlighted, however, that seven other EU countries had already given full diplomatic recognition to Palestine namely Romania, Bulgaria, Slovakia, Hungary, Poland, the Czech Republic and Malta. Cyprus was simply falling in line with the seven other EU states, who along with Cyprus, recognised the State of Palestine in 1988. Malki told reporters that there were now over 100 Palestinian diplomatic missions and embassies in the world, with Palestine "working very hard in order to upgrade (their) status". "We hope the decision in Cyprus will help others to follow," he added. According to diplomatic sources, upgrading the Palestinian mission in Cyprus had been a long-standing request of the Palestinians which the Cypriot government decided to satisfy in its final hours in power before passing over the baton to whoever is elected president this month. The decision did not go unnoticed in Israel, with Cyprus' ambassador to Tel Aviv, Dimitris Hatziargyrou, called to the Israeli Foreign Ministry earlier this week to explain his government's actions. Sources confirmed to the Cyprus Mail that Israel expressed its dissatisfaction with the move, wondering why Cyprus should choose to be the first EU country after the UN vote to take such a step. For its part, Nicosia passed on the message that Cyprus has recognised the Palestinian state since 1988, and until now, was the only EU member state of the eight that recognised Palestine in 1988 that had yet to upgrade the Palestinian mission to an embassy. In other words, the action was long overdue. Cyprus also made it clear that it continues its desire to maintain good relations with Israel, which are mutually exclusive from its relations with the island's other Arab neighbours in the region, including Egypt and Palestine. According to another source, Israel had been pre-warned about the move and was not caught by surprise. Any subsequent reaction could be understood through the need of each government to respond to its domestic audience. Some commentators suggested Cyprus made the move in an effort to shore up support among Arab countries, and by extension strengthen alliances with members of the Organisation of Islamic Cooperation (OIC), whose Secretary General is Turkish politician Ekmeleddin Ihsanoglu. One source argued that Cyprus' position on Palestine is independent of that with the OIC. He pointed out that last week's OIC conference in Cairo last week resulted in a joint communique on Cyprus which was much milder than previous ones that had been led by Turkey in an effort to support the breakaway regime in the north. In large part, this was a result of the support given by the host country, Egypt. Another view was that the traditionally Palestinian-friendly government of Demetris Christofias made a final 'gesture' to the Palestinians in the twilight hours of the former AKEL leader's presidency, following five years in power which saw Israel-Cyprus relations reach their strongest levels ever. As such, the Palestinian Foreign Minister's visit was considered an "opportune moment". Hamas urged Palestinian citizens to register for the Palestinian upcoming elections (for the Palestinian National Council, the Legislative Council and presidency). The movement stressed in a statement on Tuesday that the registration in the electoral register is a right that enables the citizens to participate in any future election. It said that the elections represent the new phase of the Palestinian people steadfastness and the completion of the resistance project towards the liberation of the land. For his part; Speaker of the Palestinian Legislative Council, Dr. Aziz Dweik, said in a statement to PIC that registering for the elections is a right and a national duty in order to update the electoral register for holding the elections. Concerning the reconciliation talks, Dweik expressed regret that the reconciliation has not been implemented till now, and stressed that the upcoming meetings between Obama and some Arab leaders will affect the serious steps towards achieving reconciliation. He has also pointed to the continuation of political arrests and summonses, which are hampering the reconciliation. The Palestinian Central Election Commission (CEC) said in a statement on Wednesday that around 70,000 people have registered to vote in the West Bank and the Gaza Strip since the Commission began updating the electoral roll two days ago. The centers are open daily from 9 a.m. until 4 p.m. and the registration process is operating according to plan, the CEC said. Private sources told PIC that Hamas supporters, together with their families and relatives, have been flocking to the registration centers in order to register their names in the electoral roll. The voter registration process is due to be completed by Feb. 18 and, in theory, an election could then be called three months later. Meanwhile, West Bank cities are witnessing a state of desperation of Fayyad government's economic and social policies, which led to an almost complete breakdown in the institutions and seriously affected the economy, amid growing financial and administrative corruption and security coordination with the occupation. A Hamas parliamentary delegation arrived in Sofia on Wednesday on the first such visit to Bulgaria. The change and reform bloc, affiliated with Hamas, said in a statement that the delegation is led by Ismail Al-Ashqar and comprises Dr. Salah Al-Bardawil and Mushir Al-Masri. It pointed out that the visit is the first of its kind to a member country of the European Union. The statement said that the delegates would have a series of meetings with Bulgarian MPs and politicians in addition to leaders of parties and other notable figures. First deputy speaker of the Palestinian legislative council Ahmed Bahr and some lawmakers on Tuesday received a Danish solidarity delegation in the Gaza Strip. Bahr stated in a speech during the meeting that the Palestinian resistance today is stronger and more capable of creating equations which the Arab nation had never known for years. "We are like an arrow in the leadership of the nation moving forward and not backwards, and we will sacrifice our money, houses, kids and ourselves in order to liberate Palestine, Jerusalem and the Aqsa Mosque," the deputy speaker added. He briefed the delegation on the Israeli violations and crimes that had been committed against the PLC and its members since the Hamas Movement won the legislative elections in 2006. Head of the Danish delegation Radwan Mansour, in turn, expressed his happiness to visit Gaza and meet its steadfast people. "We are pleased to come to Palestine, the land of pride, and to this liberated piece of land. We have come to congratulate you on your steadfastness and victory," Mansour said. "This delegation came to provide some help and support for the Gaza people, and to open some small projects that would strengthen the steadfastness of the Palestinian people," he added. Member of Hamas's political bureau Ezzat Al-Resheq said his Movement made significant progress during the meeting with leaders of the Palestinian liberation organization (PLO) in Cairo. Resheq refuted, in a press statement to the London-based Al-Hayat newspaper on Monday, news reports claiming that the meeting failed and did not achieve the results which the Palestinians were looking forward to. "Quite the reverse, we consider this round of meetings positive, even if it did not achieve the progress we had hoped for," the Hamas official stated. "Arrangements and preparations for the elections of the Palestinian national council and the restructuring of the PLO on sound foundations are just around the corner after they had been stalled since 2005," he affirmed. Commenting on the upcoming visit of the US president to Palestine, the official said that his movement is aware that there are foreign parties seeking to frustrate the Palestinian reconciliation, but it still believes that Mahmoud Abbas is keen on achieving it. In a related context, member of Hamas's political bureau Saleh Aruri said it would be useless to call for elections in light of the ongoing political arrest campaigns against Hamas cadres and supporters in the West Bank. Aruri told Al-Aqsa satellite channel that the political arrests and summonses escalated during this year in the West Bank even during the recent reconciliation talks in Cairo. He asserted that 91 arrest incidents had been documented since the beginning of the year. The Hamas official added that the Palestinian authority security forces also raided homes belonging to Hamas prisoners and martyrs, and confiscated the financial allocations of many families. The official also said that Hamas asked Egypt to send a committee to Gaza to make sure that all parties are committed to creating the atmosphere for the Palestinian reconciliation and ending all arrests and restrictions on freedoms. The Palestinian government criticized the Palestinian authority (PA) for its persistence in wagering on the peace talks with the Israeli occupation state and described it as a losing bet. Its spokesman Taher Al-Nunu said on his facebook page that the PA believes that the Palestinian reconciliation is contingent on the developments to take place following the expected visit of US president Barack Obama to the region. Nunu noted that wagering on the success of another round of peace talks with the occupation is an illusion and cannot be realized. Obama is expected to visit soon the Arab region to sponsor a peace summit between the PA president and the Israeli premier in the presence of the Jordanian king. In another context, an informed Palestinian source stated, on condition of anonymity, that the Palestinian factions agreed in Cairo on starting to execute the reconciliation files in order to create the atmosphere for holding the legislative and presidential elections inside and outside Palestine. The source told the Palestinian information center (PIC) that the parties also agreed on setting a date for the elections and the formation of the national government if favorable conditions were created. Central Elections Commission (CEC) has opened its offices in the West Bank and Gaza Strip in order to begin the process of voter registration. The process is expected to continue for a week. "The registration of voters is now beginning in the West Bank and Gaza. We hope accomplishing it will be the first step to ending the division," said Central Elections Commission (CEC) chief Hanna Nasser in announcing the start of the week-long operation at a news conference in Gaza City. Voter registration has been delayed for years due to a long-running split between the Hamas movement in Gaza and Fatah rival which dominates the West Bank-based Palestinian Authority. It is a key part of preparations for legislative and presidential elections called for under terms of a reconciliation deal signed in 2011 but which has never been implemented. 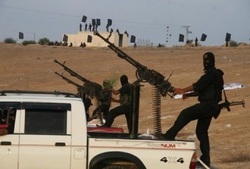 The process is likely to involve registering some 350,000 Gazans as eligible to vote, many of them for the first time. The week-long registration drive will involve 581 people who will register voter details at 256 schools across the Gaza Strip based upon lists provided by the interior ministry. Updating the electoral register in Gaza, where voter details have not been updated since the last elections in 2006, removes a major stumbling block blocking reconciliation between Hamas and Fatah. The procedure had been due to begin last year but the CEC's work was "temporarily" halted by Hamas as reconciliation efforts ran aground. The CEC reopened its Gaza offices in January 2012 but could not begin work on updating the voter lists without Hamas's permission, which it subsequently received in May. Election officials began recruiting employees and had been due to start registering individual voters when the process was suddenly halted in July by Hamas, which argued that various "obstacles" needed to be resolved before the CEC could continue its work. Monday's breakthrough came about after Hamas and Fatah made a fresh attempt to implement the 2011 reconciliation deal that called for establishing an interim government of independents that would oversee preparations for legislative and presidential elections, including the updating of voter rolls in Gaza. Over the weekend, Palestinian factions held two days of marathon reconciliation talks in Cairo which ended with a commitment to begin consultations over the formation of an interim government – another issue which has bogged down reconciliation efforts. Hamas leader Osama Hamdan has said that the meeting in Cairo about national reconciliation was positive and achieved important progress but not in the aspired for pace. He told Quds Press on Sunday that the meeting about the formation of the national unity government that was scheduled for tomorrow Monday was postponed for a few days to give room for more consultations on means of linking that issue to that of the elections. Hamdan said that PA chief Mahmoud Abbas proposed the formation of a government that would remain in power for three years and holding elections within three months and that two decrees would be issued for this purpose. He said that Hamas considered the formation of the government as a clear message to the people that the division was over but the election date should be made in agreement with all parties. A new date was yet to be determined to discuss the government’s issue, he added. The Hamas leader would not say that the reconciliation process was obstructed a new, adding that his movement was exerting all efforts possible to facilitate reconciliation. Dr. Khalil al-Hayya, member of Hamas the political bureau, said that the formation of the next government and setting the date of the elections are linked to the completion of the reconciliation files. Al-Hayya said in press statements on Saturday evening that updating the electoral register prepares the atmosphere for the achievement of the reconciliation, stressing on his movement's commitment to the Cairo agreement. "There are obstacles facing the reconciliation process and all the Palestinian factions have to remove them", al-Hayya said, pointing out that obstructing the public freedoms file in the occupied West Bank is one of the obstacles that hamper the completion of reconciliation. The Hamas leader stressed on the need to complete all the files, especially the public freedoms file, in preparation for providing the appropriate atmosphere for holding agreements on the date of the elections and the formation of the government. For his part; Moussa Abu Marzouk, deputy head of the political bureau of Hamas movement, held the Palestinian Authority President Mahmoud Abbas responsible for any failure to complete the Palestinian reconciliation. He told "Sky News Arabic" that Abbas has to implement the terms of the agreement between Fatah, Hamas and the other Palestinian factions. Abu Marzouk also denied some reports which claim that Hamas has sent armed elements to the Egyptian territories in order to support President Mohamed Morsi and the Muslim Brotherhood. He asserted that these claims aim to distort the image of Hamas movement, and added "the role of Hamas is limited to confronting the Israeli occupation." A delegation from the Central Election Committee arrived on Sunday to Gaza, through Beit Hanoun crossing in the northern Gaza Strip; for opening the election centers and starting to update the electoral register. Hisham Kahil, executive director of the Central Election Committee, told PIC that a press conference will be held on Monday, to announce the start of updating the electoral register in the West Bank and the Gaza Strip. Updating the electoral register will start on Monday and will be completed on the 18th of February. Kahil stressed that registering in the electoral register is the first step towards participating in any future electoral process, and that those who fail to register will not be able to participate in the electoral process. Cyprus announced that it has decided to upgrade the status of Palestine's diplomatic office in Nicosia from a mission to an embassy. President Mahmoud Abbas welcomed from Cairo the Cypriot decision. Cypriot Foreign Minister Erato Kozakou Markoullis made the announcement during a press conference with her Palestinian counterpart Riyad al-Malki who was on an official visit to Nicosia. Markoullis said that 'this important decision comes in line with the recognition of the Palestinian State in 1988 by the Council of Ministers of the Republic of Cyprus." She said it also follows the relevant practice of seven other European Union member states that have recognized the Palestinian State also in 1988, namely, Romania, Bulgaria, Slovakia, Poland, Hungary, the Czech Republic and Malta. Palestinian government in Gaza warned the Palestinian Authority and its president, Mahmoud Abbas, against responding to U.S. pressure and resuming negotiations with Israel. Dr. Yousef Rizqa, political advisor to Gaza Prime Minister Ismail Haneyya, told Quds Press Agency "(Barack) Obama's visits to Tel Aviv and Ramallah and his meeting with Abbas put great pressure on PA."
He explained that the American side will demand the PA to resume the negotiations with Israel, because without these negotiations the American and Israeli interests will be affected. Rizqa stressed that all Palestinian factions should reject the resumption of the negotiations, and added that "returning to negotiations will put obstacles in the way of the Palestinian reconciliation process." 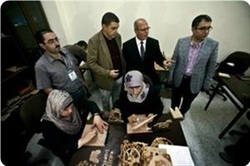 Palestinian premier in Gaza Ismail Haneyya has called on the electorates in the Strip and the West Bank to register their names at elections centers. Haneyya, in a terse statement on Friday, urged all eligible voters to head to election centers in order to update registration, adding that his government would facilitate the procedure as the first step toward ending internal division. The Gaza government called on the central elections committee to start working in the Strip as part of a series of measures to forge national cohesion and complete the reconciliation process. The procedure is to start on 11th February and would last until 19th February 2013. The Islamic Resistance Movement, Hamas, has extended congratulations to former Saudi minister of information Iyad Madani for his election to the post of Secretary General of the Organization of Islamic Cooperation. The movement wished Madani success in his new mission and hoped that he would carry out an effective role in defense of Islamic issues especially the Palestinian question. It said that the Palestinian question should be prioritized in its capacity as the central Arab and Islamic issue especially in light of the escalating “Zionist” campaign that targets the Judaization of occupied Jerusalem and Palestinian land and holy shrines. Egyptian president Mohammed Morsi, who is now the leader of the OIC for the next three years after his country hosted the 12th OIC summit, announced the appointment of Madani for five years starting January 2014 to replace the current Secretary General Ekmeleddin İhsanoğlu. Member of the Political Bureau of Hamas, Izzat al-Risheq, stated that the Palestinian government to be formed will be a government of national technocrats. He told Quds Press that the next Palestinian government will be a government of national technocrats as it was agreed upon during the reconciliation agreement. There is no change to the situation, and it seems that the non-accurate translations to the BBC interview with Khaled Mashaal have caused ambiguity and confusion," he said. On Friday, a meeting of the PLO faction leaders was held to discuss ways of implementing the reconciliation agreements. It is expected to start next Monday consultations to form the Palestinian government headed by Mahmoud Abbas in conjunction with the start of the work of the central election commission in the Gaza strip. Leaders of Palestinian factions held an expanded meeting, on Friday in the Egyptian capital Cairo, in order to discuss the activation of the PLO and the implementation of the Palestinian reconciliation. The meeting was held in the presence of the secretaries general of the Palestinian factions, Hamas and Islamic Jihad leaders, members of the Executive Committee of the PLO and the President of the National Council, in addition to a number of independent national figures. Khaled Meshaal, head of Hamas political bureau, arrived in Cairo on Thursday to attend the meeting. PA president Mahmoud Abbas met, on Thursday evening at his residence in Cairo, leaders from the intelligence service to discuss the latest developments on the Palestinian arena, especially the ongoing consultations for the implementation of the reconciliation agreement in preparation for the meeting of the factions' leaders. Abbas discussed with the Secretary General of the Islamic Jihad Movement efforts made to implement Cairo agreement on Palestinian reconciliation and ways to overcome the difficulties facing the implementation of the agreement on the ground. 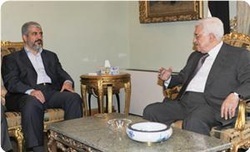 Fatah and Hamas movements agreed, on January 17, on timetable and timings to start the implementation of the reconciliation agreement, which had been signed on 4 May 2011. The Palestinian Legislative Council (PLC) held a special session on Thursday to shed light on violations of the Israeli occupation in the city of Jerusalem during the year 2012. Dr. Ahmed Bahar, First Deputy head of the PLC, hailed in his speech the hunger striking Palestinian prisoners, and congratulated the prisoner Akram Rikhawi for his release on Thursday after a hunger strike that lasted more than 120 days. Dr. Bahar demanded the 12th Islamic Summit held in Cairo, to support the Palestinian cause and Jerusalem with all possible means. MP Ahmed Abu Halabiya reviewed the report of the Jerusalem and Al-Aqsa Committee about the occupation violations in the city of Jerusalem against Al Aqsa Mosque and the Islamic and Christian sanctities in the past year. Abu Halabiya talked about the attacks on the city of Jerusalem, including the demolition of houses and installations, bulldozing the lands, the escalation of settlement activity and arrests and the enactment of Israeli racist laws. The report called on the Palestinian government to make efforts ​​to support the steadfastness of the Palestinian residents of Jerusalem. Hamas delegation, headed by head of the movement’s politburo Khaled Mishaal arrived in Cairo on Thursday evening to participate in meetings of PLO leaders and meetings on the formation of the new Palestinian government. Hamas official Izzat al-Rishq said that the meeting of the PLO leaders will discuss the system of the elections to the PLO's parliament, and the composition of a supervisory committee. Hamas and Fatah officials are meeting on Sunday to discuss the composition of a Palestinian unity government, al-Rishq said. Hamas stated that its delegation, which has arrived in Cairo headed by Mishaal, will discuss with the Egyptian President Mohamed Morsi the obstacles that hinder the achievement of the Palestinian reconciliation, most importantly the file of the political detention. For his part; Hamas leader Salah Bardawil said that his movement delegation will insist, in Cairo meetings, on the application of all the terms of the reconciliation file as "one package". Egyptian President Mohamed Mursi, confirmed that the Palestinian issue was, still is and will remain the cornerstone for achieving security and stability in the world, and it will remain "our main cause and the ultimate goal of our organization, which was established after al-Aqsa mosque fire in 1969." Mursi, who headed the 12th Islamic Summit in Cairo, said that the most important objectives of the organization are to support the Palestinian people's right to resist, to restore their legitimate rights and to establish their sovereign state with Jerusalem as its capital. "Egypt is clearly and firmly committed to supporting the Palestinian people until they gain their freedom in an independent state," Mursi said. He stressed that "Egypt has sought to support our brothers trapped in Gaza, and to stop the brutal assault they suffered last November." Mursi congratulated the Palestinians for granting Palestine Observer status by a United Nations General Assembly resolution. He called for a united Islamic decision to face the Israeli settlement on Palestinian lands. "The international community has a responsibility to stop settlement activity on Palestinian land, which stabs the peace process in the heart,” he added. He pointed out that the Summit will discuss in a special session on Wednesday evening the settlements issue, calling on leaders to contribute actively and positively in the deliberations of the meeting. A summit for the Organization of Islamic Cooperation opened in Cairo on Wednesday, attended by leaders of 26 states. 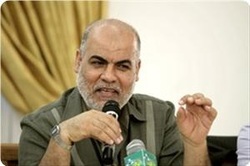 A delegation of the Hamas movement is to head to Cairo on Friday to attend a meeting on reactivating the Palestine Liberation Organization, Dr. Salah Al-Bardawil, a Hamas leader, said. He told Jordanian daily Al-Ghad published on Wednesday that the meeting, on 8-9 February, would also look into the formation of an election committee for the national council (the PLO parliament in exile) and finalizing the elections law. Bardawil described the meeting as one of the steps toward concluding national reconciliation, adding that a concentrated national effort is required to complete the reconciliation process. 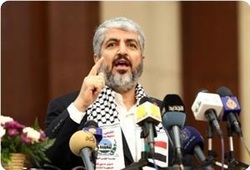 In another context, the Hamas leader affirmed that Khaled Mishaal was adamant on refusing his re-nomination as political bureau chief of Hamas. Yehia Mousa, a leader of Hamas and a member of its parliamentary bloc, confirmed that the U.S. efforts in the region for the resumption of negotiations between PA and Israeli government may affect the reconciliation process. Mousa told PIC that the reconciliation is moving quickly in the right direction despite the existence of obstacles, and stressed that Fatah has to implement the decisions regarding the public freedoms to prove its sincere intention to move forward towards the reconciliation. Concerning the campaign of arrests launched by the occupation forces against the leaders and MPs in the West Bank, the Hamas leader said that the Israeli occupation seeks to undermine all the efforts made to achieve a state of harmony and consensus in the West Bank. Political bureau member of Hamas Ezzet Al-Resheq has vehemently denied press reports that Qatar paid 250 million dollars to his movement in order to protect Egyptian president Mohammed Morsi. Resheq said in a press statement on Tuesday that the report by some newspapers and websites was completely untrue. The report claimed that the Qatari government offered Hamas political bureau chairman Khaled Mishaal 250 million dollars in order to preserve the life of Morsi and stability of his rule for the longest possible period. Resheq said that the report was a sheer lie and aimed at distorting the image of his movement and to influence the reconciliation atmosphere that is patronized by Egypt. Sami Khater, member of Hamas’s political bureau, stated that the Palestinian political atmosphere is appropriate to achieve reconciliation and end the division, without denying the existence of some obstacles. The arrest campaign, carried out by occupation forces against a number of MPs and Palestinian leaders in the West Bank on Monday, was an attempt to undermine the reconciliation efforts, Khater told Quds press. Despite the Israeli attempts to impede the reconciliation efforts, Hamas movement is still determined to achieve reconciliation and end the division," he added. He explained that the current atmosphere encourages ending the political division between the West Bank and Gaza Strip, saying there is no doubt that the political climate today is much better than before. Khater stressed that reconciliation constitutes a strategic aim to Hamas movement but it cannot be at the expense of resistance and Palestinian constants. He said that the Egyptian leadership is the responsible to estimate the Egyptian internal circumstances to hold a meeting on Friday or not, stressing on the movement's determination to achieve the national reconciliation. Dozens of representatives of the national and Islamic forces in the occupied city of Jerusalem demonstrated on Monday afternoon against the European Commission headquarters in Sheikh Jarrah, condemning its dependence on the United States, and its financial support of the Israeli policies. The protesters handed over a memorandum to the Union officials, clarifying their position about the European Union economic and political policies towards the Palestinian cause. "After losing its political role in the region because of the inability and lack of resources on the one hand, and due to its dependence on the United States and its fear of "Israel" on the other hand, the EU emphasized its economic and financial supportive role to the Israeli policies and Judaization in the city of Jerusalem,” according to the memorandum. The European Union has recently designed projects ostensibly supporting the Palestinian people but in reality it penetrates the Palestinian position that rejects the presence of the occupation and its Judaization policies in occupied Jerusalem, the memorandum added, stressing that "Partnership for Peace" program aims to implement partnership between Palestinian, Jordanian and Israeli institutions. The memorandum pointed out that the national forces in the occupied city of Jerusalem categorically rejected any partnership with Israeli institutions, considering it a violation to the national consensus, stressing to derail any meeting convened as recognition of the legitimacy of the occupation of the city of Jerusalem. The national forces confirmed their rejection the position of some institutions that go along with the European approach, warning against the consequences. The national forces also called on PA to declare its rejection to these projects and programs that affect the national rights. Dr. Sami Abu Zuhri, a Hamas spokesman, has said that there was no hope of a real and essential change in the US foreign policy in the second term in office of president Barack Obama. Abu Zuhri said in a press release on Sunday that Obama’s speech indicated that there would be no major changes in his country’s foreign policy towards regional issues. He said that Washington’s bias in favor of Israel would not witness any change at least at the current stage. Abu Zuhri warned the Palestinian Authority against falling into the trap of renewing negotiations with Israel, pointing in this respect to the new American foreign minister John Kerry’s expected visit to the Middle East. He said that Kerry’s visit to the region and meeting with the PA leadership would not produce any new positions, adding that the PA should be deceived into accepting a return to negotiations. Khaled Mishaal, head of the political bureau of Hamas, announced that saying his movement accepted a Palestinian state with temporary borders is fabrication. This came during Mishaal's speech, which was broadcasted on the Jordanian official TV channel on Saturday evening, and in which he asserted "We cannot accept a substitute for Palestine". The Hamas leader described his recent visit to the Jordanian capital Amman as a positive step to strengthen the confidence based on transparency and mutual understanding between Hamas and the Jordanian leadership. He discussed with the Jordanian leadership the developments of the Palestinian - Jordanian relationship, in addition to the Palestinian reconciliation, the enhancement of the national unity and the Arab - Israeli conflict. Mishaal welcomed Jordan's role in the implementation of the Palestinian reconciliation, stressing that the Palestinian division forms a burden on the whole Arab nation. 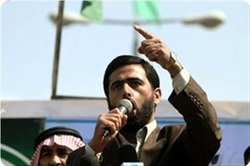 Concerning the events in Syria, the head of Hamas political bureau confirmed that his movement cannot be siding with the Syrian regime against its people, especially after dragging the Palestinian refugee camps in Syria into the Syrian internal conflict. Member of the Palestinian Legislative Council for Change and Reform bloc, Mushir al-Masri, called on the Arab and Islamic nation's leaders and peoples to participate in a strategy for the Liberation of Palestine and to support the armed resistance. Al-Masri stressed, during his participation in a festival in Tunis, the important historical stage witnessed by Arab and Islamic nation and the Palestinian cause in light of the Arab spring that drew new features in the Israeli Arab conflict. He greeted the Tunisian people and leadership, saying that the Tunisian revolution was the first step towards the liberation f Palestine, pointing out to the slogan proclaimed by the Tunisian people in their revolution, "The people want to liberate Palestine." Al-Masri stated that the Arab revolutions will affect positively the Palestinian cause sooner or later, noting that the conspiracies being plotted against the Arab revolutions and against the people's will that chose their representatives through the ballot boxes. He stressed that the Palestinian resistance has developed after its victory in Shale Stones from defending stage to attacking stage, adding that the Israeli aim to establish it greater Israel has dissipated. Ekmeleddin Ihsanoglu, Secretary General of the Organization of Islamic Cooperation, demanded the Organization's member states as well as international organizations to protect the monuments and enact laws protecting the cultural heritage. This came in a speech delivered by Ihsanoglu during the Conference of cultural heritage protection, which was held in Cairo on Thursday, in cooperation with the Egyptian Ministry of Antiquities and the Research Center for Islamic History, Art and Culture (IRCICA). The Secretary General of the Organization of Islamic Cooperation called for repairing and maintaining the ancient monuments and protecting them against theft. He warned of the continuation of Judaization of the Palestinian cities, especially Jerusalem, referring to the excavations which the occupation forces have carried out in Al-Aqsa Mosque and the ongoing displacement of the Arab and Muslim residents of Jerusalem city on political and administrative grounds. MP Jamal al-Khudari, head of the Board of Trustees of the Islamic University of Gaza, announced the start of the "Irada" project providing jobs for 400 Palestinians who have been affected by the aggression on Gaza and those with special needs. Khudari thanked, in a statement, the Turkish Prime Minister Recep Tayyip Erdogan, who is funding the project, for such support, noting that the Turkish support in the fields of education, health and infrastructure had played a significant role in the development of Gaza. The first phase of the project aims to qualify the associate members through a number of academic diploma programs and many craft programs. Hamas Politburo chief Khaled Mashaal has asked Jordan's King Abdullah II to inform US President Barack Obama that Hamas accepts the principle of a two-state solution, Saudi Arabia's al-Sharq newspaper reported. According to the report, which quoted Jordanian sources, Mashaal expressed willingness to stand behind a solution that will see a Palestinian state being established on the 1967 borders during a meeting with the king on Monday. Mashaal said that the meeting had dealt with the Palestinian issue in the wake of the elections in Israel and the US. He noted that he also discussed reconciliation between the Palestinian factions with the Jordanian king. Jordan's king noted that he held a series of meetings in an effort to restart peace talks between Israel and the Palestinians. He stressed that the parties tried to establish a clear timetable for a two-state solution which he said was "the only way to obtain security and stability in the Middle East." Reports from Palestinian outlets said the Palestinian President Mahmoud Abbas will meet with representatives from Hamas and the Islamic Jihad, as well as other Palestinian factions, on February 8 in Cairo for a PLO reform summit. Abbas and Hamas chief Khaled Mashaal met in Cairo earlier this month in efforts to advance Palestinian reconciliation, and this meeting will continue those efforts.